Koulourakia can be formed into many shapes. These small sesame-coated cookies are generally made in small oval shapes and rings. The cookie dough is softer and oilier than many other recipes, and the end result is a crispy, delicious cookie. Other recipes call for up to 3 cups of sugar, but I prefer this less-sweet version. Put the sesame seeds in a strainer and wash well under cold, running water. Shake to remove excess liquid, and set aside to drain for 1 hour (they will still be damp). Dissolve the baking soda in the lemon juice. In a mixing bowl, combine olive oil, lemon juice (with baking soda), grated peel, brandy, cinnamon, cloves, and hot water. Beat on medium-high to combine. Add sugar and beat until well blended, and not separating (about 5-8 minutes). Slowly beat in 8 cups of flour mixture. When the flour is mixed in, turn the dough out onto a floured surface (or knead in the bowl) and knead by hand for 10-15 minutes, adding more flour if needed, until the dough doesn't stick to your hands. The dough will be soft. Take a piece of dough the size of an unshelled walnut and squeeze it in your fist to form a dense ball. Roll out into a rope shape, about 3 inches long. 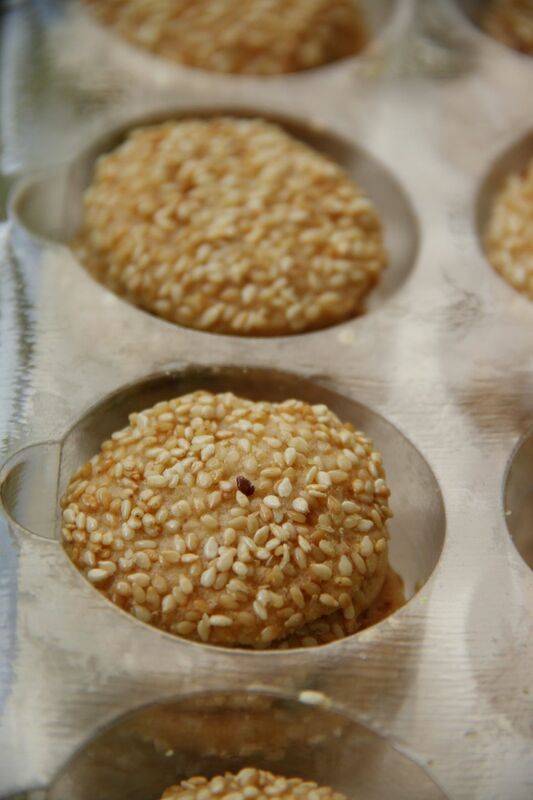 Dip in sesame seeds and pat to flatten and push seeds into the surface of the cookie. The cookies can be left as is or formed into rings (pinch ends together). For more details, see How to Make Sesame Cookies in photos. Bake on the rack under the middle of the oven on non-stick or very lightly oiled cookie sheets at 425°F (220°C) for 15-20 minutes, until dark golden. Cool completely before serving. When completely cooled, store in airtight plastic containers. They will keep for up to 2 months. They can be frozen for longer periods.